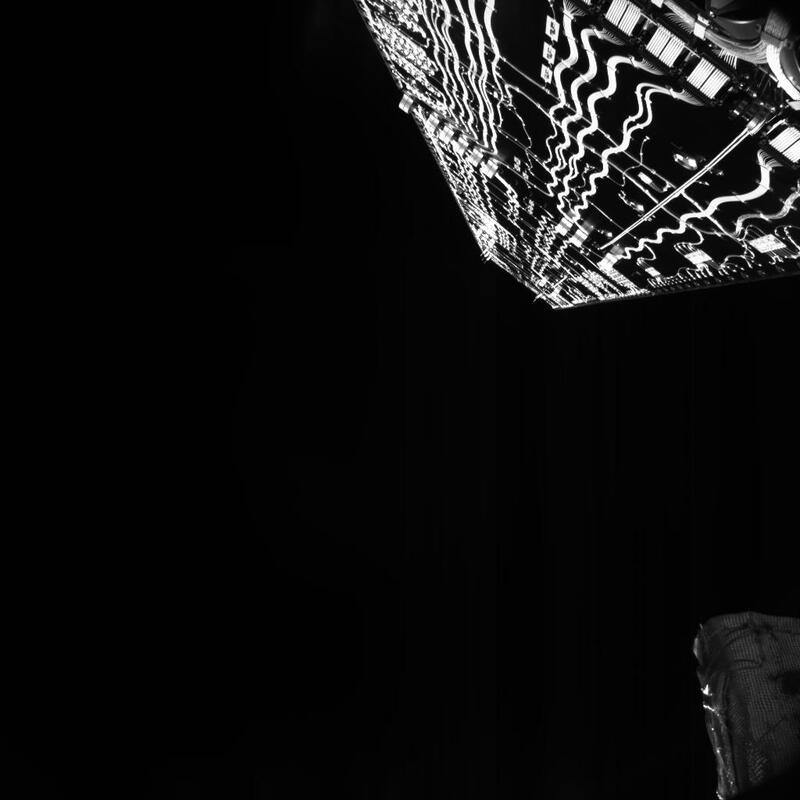 On 4 November 2018 the Mercury Transfer Module (MTM) of the ESA-JAXA BepiColombo mission was commanded to conduct a special one-off activity, called the "solar array drive run-in". This operation consisted of performing several rotations of the MTM solar array over its full movement range, to clean the solar array drive mechanism slip ring from contaminants accumulated during the long ground testing phase before launch. The operation saw the back side of the arrays turned towards the Sun, and at the same time into the field of view of one of the MTM's monitoring cameras – M-CAM 1. One image is presented here, with the exquisite details of the cabling and mechanisms on the backside of the array visible. Watch the full sequence here. The image has an exposure time of 20 milliseconds and a resolution of 1024 × 1024 pixels. The structure seen in the bottom corner is one of the sun sensor units on the MTM, with the multi-layered insulation visible. BepiColombo is a joint endeavour between ESA and the Japan Aerospace Exploration Agency, JAXA. The European built MTM is carrying ESA's Mercury Planetary Orbiter and JAXA's Mercury Magnetospheric Orbiter on a seven year journey to the smallest and least explored planet in the inner Solar System. It is the first Mercury mission to send two science orbiters to make complementary measurements of the planet and its dynamic environment at the same time.